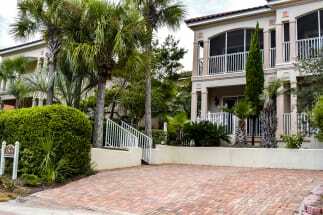 Welcome to the La Valencia Beach vacation rentals in Panama City Beach, Florida! These beautiful properties are just seconds from the beach with a private gated community beach side pool! La Valencia offers unbeatable Gulf Views and endless amenities and activities. Just minutes east is Pier Park’s entertainment hub and restaurants and shopping are plentiful in all directions. Grocery stores and some restaurants are less than a mile away. If you are looking for specific places to eat, some of the local favorites are Bayou Bill’s Crab House and Sunnyside Grill. La Valencia Beach is an ideal destination for your family vacation. Take the family to Coconut Creek Family Fun Park, Gulf World Marine Park, Shipwreck Island Water park, or Wonderworks Panama City Beach for a fun experience. You can always spend the days on the beautiful white sandy beaches, deep sea fishing with one of the local fishing charters, or even parasailing over the emerald green waters of the Gulf. The fun never ends with so much to do! Plan your next vacation to La Valencia Beach with emeralcoastbyowner.com. Our owners will deal with you directly and will assure you the best price for your vacation. Book your trip to La Valencia direct with ECBYO and you will save. We hope you enjoy your trip to the Emerald Coast!